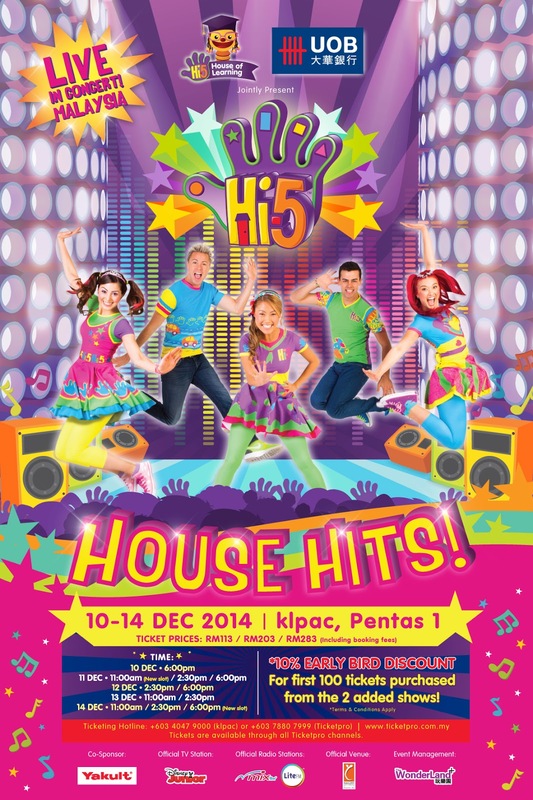 More HI-5 HOUSE HITS 2014 shows to meet overwhelming demand!! Now with more tour dates!! The best-selling Hi-5 children musical group has an unprecedented popularity worldwide and there’s no exception in Malaysia. Since the dates for Hi-5 House Hits 2014 Live in Malaysia show were announced to the public in late September, the response from our local fans has been phenomenal. To accommodate the demand for tickets, Hi-5 Operations, the organiser to this fanfare production has added 2 more shows, for 11am on 11 December and 6pm on 14 December, to the original show schedule summing up to a total of 11 shows available for the public. Indeed great news and relief for the excited children and parents in this region to have this valuable chance to enjoy and truly experience this unique and extravagant musical show. In conjunction with the two newly announced dates, Hi-5 fans in Malaysia who have yet to purchase tickets will now have an opportunity to grab early bird tickets specially set aside for this 2 additional shows. The first 100 tickets purchased from any category from these 2 shows will enjoy a 10% discount from the original ticket pricing. Tickets are managed by ticketing agent Ticketpro and all tickets for this 2 additional shows will be made available through all TicketPro channels and the show venue (klpac) starting at 10am on this Friday, 31 October 2014. Hi-5 House Hits 2014 is jointly presented by UOB Bank and Hi-5 House of Learning, Co-Sponsored by Yakult, Official TV Station Disney Junior, Official Radio Stations Mix and Lite FM, Official Venue klpac and the Event Managed by The WonderLand+. Hi-5 House Hits 2014 Live in Malaysia opens on Wednesday, 10 December 2014 at The Kuala Lumpur Performing Arts Centre (klpac) and runs until Sunday, 14 December 2014. Tickets for the show are selling really fast so don’t miss this chance to catch The all-Australian cast of Stevie, Ainsley, Mary, Dayen and new member, Tanika, who will all put on their dancing shoes and sparkle on stage, for a very memorable and dazzling up close and personal show experience for all the fans. For more information, do visit www.ticketpro.com.my or ticketing hotline at +603 4047 9000 (klpac) or +603 7880 7999 (Ticketpro).